Opening Microsoft's Professional Developers Conference, Chief Software Architect Ray Ozzie finally unveiled the services strategy he's been driving Microsoft towards since he arrived at the company in 2006 as Bill Gates' anointed replacement. Windows Azure is the expected "Windows in the cloud" and it's going to be running services and applications you'd normally use on your desktop. But forget everything moving into the browser, even with Silverlight. Azure is "a turning point for Microsoft" according to Ozzie but he expects it to work alongside servers in business and rich applications on the PC. And today Ozzie will announce Windows 7, which he calls "an operating system that will enable a new generation of applications that span the PC and the Web", sticking with the Microsoft idea of 'software plus services' where PC applications use all the power of the PC, but get extra features when you're online. The virtualization techniques and shared utility computing that enable cloud computing may have been around for decades, but it's the hardware in users hands today that make Microsoft think it's time for cloud services. According to Ozzie, demand for the cloud is "driven by cheap computing and cheap storage, by the increasing ubiquity of high bandwidth connectivity to the internet, by an explosion in PC innovation from the high-end desktops to low-end netbooks, by an explosion in innovation in devices - from media players and smartphones to net-connected devices of all shapes and sizes." Windows Azure is based on Microsoft technology like an optimized version of the new hypervisor, and on what Microsoft has learned from building services like MSN, Windows Update and Office Online Help. Azure runs on "a vast number of machines" in Microsoft's data centres, first in the US and later around the world. And over the next two weeks the 6,000 developers at the conference will get free access to the 'Community technology Preview' version of Azure, which is what Microsoft calls its prototypes. The initial features are "only a fraction of what you'll see on our roadmaps," Ozzie promised, claiming that Azure will also change based on what developers want from it during the rest of 2008 and through 2009. But he proclaimed Azure as "setting the stage for the next 50 years of systems" and working as a new tier of computing for "systems serving potentially everyone in the world." Like Windows Server, Windows Azure is really a development platform and Bob Muglia, vice president for servers and tools, claims it lets developers use the skills they've developed on Windows rather than learning a whole new set of tools. He also promised Microsoft won't abandon software that runs on local servers, and that they'll take what they learn from running Azure and add it to new versions of the server software. But there will be online versions of all Microsoft enterprise software through the Microsoft Online service, which can be extended using Azure. That means you could take Dynamics CRM Services, create a custom ribbon in Word and add extra features using Azure. Apart from the connection to desktop applications like Office, that's the same principle as taking Salesforce's CRM service and extending it on the Force.com platform. 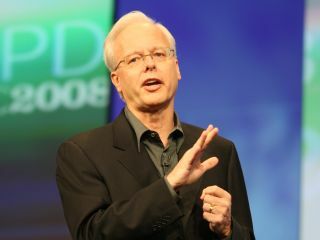 Ray Ozzie acknowledged Amazon's contribution to cloud computing. Not so much for the EC2 cloud service it launched while Microsoft was still busy planning Azure and updated last week to support Windows Server and Windows SQL Server though; Ozzie claims Microsoft has "broader objectives." But because it pioneered what Ozzie called a "base level" of designs and business models for cloud computing. He didn't mention other competitors like Google's AppEngine or Salesforce, who had rickshaws and donuts outside to remind PDC visitors that Microsoft is a latecomer to cloud computing. But he did reminisce about his own years as a developer and Microsoft competitor when he kept on choosing Microsoft platforms himself, partly because Microsoft covered so much of the market that any new Microsoft platform was likely to succeed. But he also subtly reminded companies worried that Microsoft is going to compete with them as well, by selling services that the company knows it needs them to be successful. It's a balancing act Microsoft has pulled off for decades, and making it work again is going to be as important to Azure's success as making sure that it really is available 24-7.